If you are an international student in the United States interested in becoming a librarian, you are going to need to study library and information science, either at an undergraduate or graduate level - or both. By studying library and information science, you will learn the skills you need to work as a librarian or information consultant. Does the program also offer a master’s degree that’s accredited by the American Library Association? Does the program offer a bachelor of science in education (B.S.Ed.)? What requirements do I need to meet in order to be certified as a school librarian? Does the program offer opportunities for hands-on learning and experience? What do currently enrolled students and recent graduates from the program have to say about the program? Most professional-level librarian positions require an ALA-accredited master’s degree in library and information science. This degree is referred to as an MLS, MLIS, MSIS, MSLS, MA in LS, or MS in LIS, depending on the school at which the program is offered. Many students choose to earn a bachelor’s degree in another area of interest before pursuing a master’s degree in library and information science. For instance, if you are interested in working as a science librarian, you might consider earning a bachelor’s degree in science before continuing on to a master’s degree in library and information science. Your undergraduate degree is less important to your later career than your MLS, but your undergraduate major or minor can help you to focus your career path and provide useful background for future specialized professions. Although some smaller or rural libraries are staffed by non-MLS workers, if you want to pursue a career as a professional librarian, you are going to want your MLS. This gives you a much better chance of securing a position in a library, and MLS workers are generally paid better than non-MLS workers. Archivists care for permanent records and historically valuable documents. These might include papers, letters, diaries, clippings, legal documents, maps, films, videos, sound recordings, and other records. Computer systems analysts improve existing technology and business processes and create new computer systems. Curators run the educational, research, and public service activities of museums, zoos, and other institutions. Teachers work in public and private elementary, middle, and high schools and seek to prepare students for college or the work world. 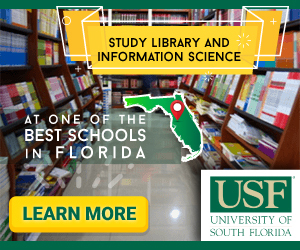 Visit the Study in the USA School search to find schools that offer programs of study in Library and Information Science. Over time we will be updating this section and including more information for those who want to study library and information science in the USA and for other countries, but please feel free to post your thoughts and comments on our Facebook fan page, and also follow us and post questions through Twitter.